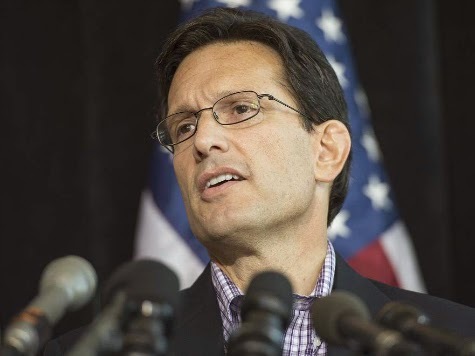 On Saturday, Tea Party activists ousted a top ally of House Majority Leader Eric Cantor (R-VA) from a key Virginia chairmanship in Cantor's own district, underscoring discontent Cantor is facing from conservative activists at home. Conservatives mobilized against Linwood Cobb – the powerful, incumbent 7th district GOP Chair who was working with Cantor's top establishment consultants and political action committees to take power away from grassroots delegates – to elect Fred Gruber to the chairmanship. The victory was surprising because Cantor's district, in the state capital of Richmond, is home to much of the GOP establishment machinery that wards off such insurgencies. Patrick McSweeney, a former Chair of the Republican Party of Virginia who helped organize the efforts along with others like Jamie Radtke and Russ Moulton, told Breitbart News that in a "contentious" convention, Tea Party conservatives "were joined by other disaffected people in the District in showing their disgust with the heavy-handed way the Cantor machine had been attempting to control the Party." The District Chair plays an important role in deciding whether Republican candidates in Virginia will be nominated in primaries or at conventions. Since nominating conventions favor conservatives, Virginia's Republican establishment, led in part by Cantor, has been trying to control who is seated as a delegate to the conventions. Although early iterations succeeded, the plan now appears to be backfiring, energizing the base instead on Saturday much to the chagrin of moderate former Lieutenant Gov. Bill Bolling, who said in a statement that he was "extremely disappointed" to hear of the results. “Clearly, there is a battle taking place for the heart and soul of the Republican Party. We are seeing this battle play out all across our state," Bolling lamented before calling conservatives the "extreme voices" that seek "to control our party and determine its future direction." Bolling refused to support Republican gubernatorial nominee Ken Cuccinelli after Cuccinelli bested him for the Republican gubernatorial nomination, undermining the Republican's chances of winning the race in 2013. Conservative activists say they have resented establishment Republicans like Bolling who preach "unity" only when their candidates win, and McSweeney said there "was also a longstanding resentment of the tactics of Cantor's consultants" for similar reasons. One of those consultants was Boyd Marcus, the former partner of Cantor hand Ray Allen who joined Democrat Terry McAuliffe's campaign last year. Local reports noted the anger at the Cantor machine and said the ouster was about the grassroots "finally having a seat at the table inside the Republican Party" in Virginia after Cantor and his lieutenants had been circling the wagons to "ensure as much control of the local politics surrounding him as possible." Part of that has to do with controlling the nominating process, and reports about the hostility toward Cantor also had to do "with a preference among many grassroots activists for nominating candidates via conventions rather than consultant-driven open primaries." Cantor also spent time at the convention attacking his primary opponent Dave Brat, whom Gruber, the new district Chair, supported. Facing boos and heckles, Cantor appeared unsure of himself, attendees said.